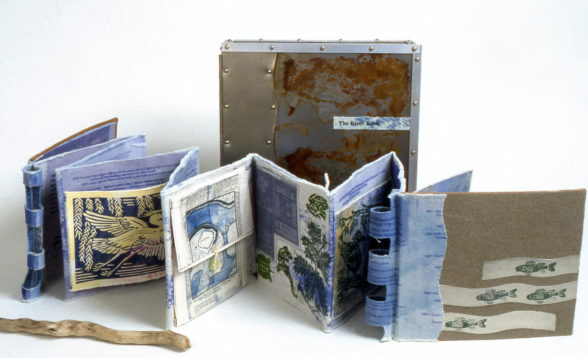 Artists books are books that are also artworks. They may be bound traditionally, in creative bindings or not bound at all. They may be in small editions, or one-of-a-kind. Mine are mixed media, but usually include fabric, printing, drawing, painting or dyeing. Mixed media, fabric, found objects, hand-made metal box, metal strips, sticks. Dyed, solar printed, sewn, printed, stick binding that opens. Recipient of a Jerome Book Arts Grant, the Riverbook explores the history, ecosystems, plants, animals and changes of the Minnesota River. Dyed, printed, sewn, embroidered, painted, solar printed, computer printed. This books explores the different seasons and some of the animals and plants that are part of Mounds Park and its watershed that leads into the Mississippi River in Saint Paul. Mixed media, fabric, blotter paper, seeds. This book is about some of the native plants that were plowed under during the early years of turning the native prairie into farmland in Minnesota. Many of these plants are now endangered or rare. Printed, sewn, painted, block printed, dyed, drawn. Looking at some of the animals, plants, and landscapes of Horicon Marsh, Wisconsin.